Award winning songwriter Adrian Conner, “Vocally sweet, musically snarling” (Kevin Curtin, Austin Chronicle) mellows that snarl to a purr with her eighth release Hush! Hush! is a compilation of re-imagined original songs and cover songs doused with shimmering acoustic guitars, upright bass, and drums. Described as “Exciting, rambunctious and kinda scary” byGuitar Player Magazine; Adrian delivers interpretations of acoustic metal songs like Zeppelin’s Bron-Y-Aur stomp with a sweet voice as well as her original pop rock material. Some of which are co-written with Kathy Valentine of the Go-Go’s which won Adrian a Best of Austin Music Award. 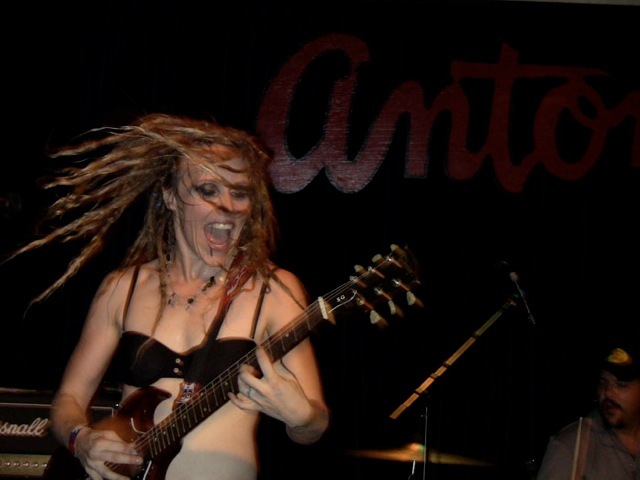 Her affection for all things rock n’ roll is evidenced by the fact that she has spent 15 years as the lead guitarist in Hell’s Belles, the highly touted all female AC/DC tribute band from Seattle, WA of which Angus Young himself is a fan. She serves in a similar capacity for the Judas Priest tribute Belles Bent For Leather. Despite spending an enormous amount of time touring in support of both projects, the Austin rocker finds plenty of time to feed her songwriting soul by touring also with her solo band. Some highlights of which include opening for Concrete Blonde, Brody Dalle, the Texas Tornados and a 2015 SXSW showcase.